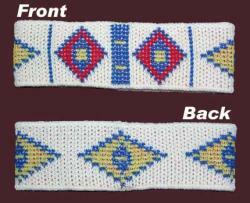 We often get request from clients with special needs for a Native American design for an Indian Nation or Event. This design was inspired for the Arikara Nation. The Arikara is part of the Three Affiliated Tribes of Mandan, Hidatsa, and Arikara located at the Fort Berthold Reservation in North Dakota. In the broader sense, they are part of the "Plains and Prairie" tribes which encompass the area from the Rocky Mountains to the Mississsippi Valley and from Texas and Oklahoma north into Canada. Size: Adult: One Size Fits Most, stretches to fit, then bounces back into shape. The Geometric designs of the Plains and Praires Native American Nations are very colorful. They consist of colors such as white, black, greens, blues, reds, and yellow variations. Their colorful beadwork with precision can be seen in museums and collections. We had the opportunity to visit the Museum of the Three Affiliated Tribes in New Town, North Dakota, which had exhibits of the beadwork. The event for this inspiration, is for a client who will be part of a re-enactment of the Lewis and Clark exhibition. Part of this re-enactment is of when Lewis discovered Joseph Graveline, a trader who had lived with the Arikara tribe for 18 years. He proved to be a great source of solid information and a superb interpreter, something the captains desperately needed when they tried to negotiate with the Sioux. "Discovery Expedition of St. Charles, Mo., with its cadre of more than 150 reenactors, has developed the necessary contacts, unique preparation and credibility required to assume the central role they have been asked to play in the Lewis and Clark bicentennial commemoration...reenacting in 2003 to 2006 their journey on the Ohio, Mississippi and Missouri Rivers." Quote from the lewisandclark web site. Ross said "The two piroques will leave Mandan, ND on April 18, 2005 and hope to reach the pacific Ocean in November. The keelboat will leave Sioux City April 19 and will be in St Louis May 27." We are always honoured to place a small part in helping recognize these historic events. Many Tribes use Geometric Designs in their Basketry and Beadwork along with Florals. So the same design may be recognized by a different name dependant upon the area. Some of the Indian Nations that use Geometric Designs within their art are: Apache, Aztec, Blackfoot, Cherokee, Choctaw, Chippewa, Comanche, Chumash, Coast Salish, Fox, Hupa, Haida, Inca, Karuk, Klamath, Kwakiutl, Lakota, Maidu, Mayan, MeWuk, Miwok, Modoc, Navajo, Nez Perce, Nootka, Ojibwa, Paiute, Pit River, Pomo, Seminole, Shoshone, Sioux, Tlingit, Umatilla, Ute, Wailaki, Washo, Wintu, Yakama, Yokut, Yurok. In modern day, Headbands are a great cover over the ears or as a Hair Accesory. Both Male and Female enjoy wearing them just for the style. If you don't like covering your whole head top with a cap, this is a great alternate choice. The Artisan, Sharon Nani, has been knitting and designing knitwear for over 40 years. She has written patterns and knit products for Knitwear Magazines in USA, England, and Switzerland. In 1982, Sharon started working with the Native Americans on the Hoopa Reservation in Northern California in developing and marketing knitwear products with their Basket designs. Since then Sharon has expanded out to work with other Native American Nations and designs. These knitwear products are designed and knit with the greatest respect and appreciation of the Native American culture and art represented in these Art Styles. The inside of the band has been hand finished so there is no bulky seam allowance allowing for a very comfortable feel and fit. The double bed birdseye jacquard is a perfect fabric to simulate the beadwork of the Plains and Priaire Native American Nations. Submitted by Emailed in Review on Sun, 09/16/2012 - 15:45.
and service come highly recommended.